(SPOILERS) The sort of earnestly rote film that makes you long for Baz Lurhmann’s garish, musical extravaganza version, complete with a spangle-packed Lady Gaga cover of Suffragette City as Carey Mulligan backflips down a cobbled street, simultaneously bashing the Fuzz and sticking it to the man. All very commendable to make a picture about an epochal movement (I was particularly interested to learn the Swiss didn’t give women the vote until the 1971 – those ruddy Swiss! ), less so if you broach the topic in the most obvious and least incisive of manners. 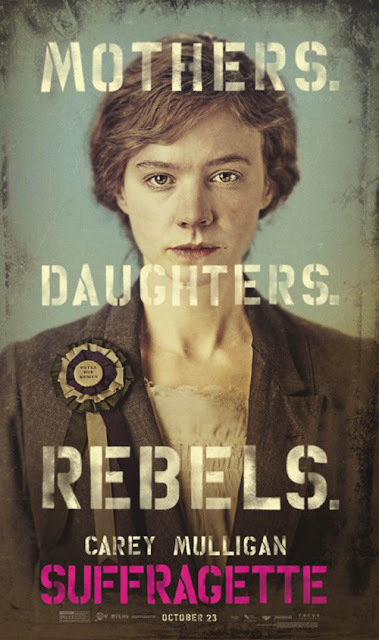 Carey Mulligan is Maud Watts, a laundress caught up in the women’s suffrage movement while experiencing first-hand the less venerable side of the male of the species, from a predatory supervisor (Geoff Bell) to a hubby (Ben Wishaw) who only seems like a decent sort until his wife’s waywardly disruptive political activities lead him to put her out on the street and then give their child up for adoption (the spineless poltroon). Then there’s the Filth, handing out beatings with abandon. Apart from the considered but only partially comprehending one (Brendan Gleeson), who wants to turn Maud informer. There’s a strong whiff here of young actors trying out working class accents for size, accompanied by the reek of history-lite. Helena Bonham-Carter (the great-granddaughter of then PM Asquith) uses her customary posh tones, though, as the direct-action doctor, while Meryl Streep tackles another real-life figure, standing at a window and waving encouragingly as Emily Pankhurst. It’s all a little pedestrian, those parts that don’t actually galvanise a reaction by simple virtue of the injustice on display. But that’s an easy lever to pull, and this should try harder. Matters even reduce to a race against time for the climax, like a suffragette Day of the Jackal, as Gleeson (remarkably) deductively heads for the Epsom Derby to prevent whatever it is Maud is there for from transpiring. But too late! History will out. Anne-Marie Duff’s is easily the most impressive performance. Everyone else seems to be donning the bonnets and voices, to a greater or lesser extent. Abi Morgan also wrote the Maggie-biopic no one asked for, The Iron Lady, and Brick Lane for Suffragette’s director Sarah Gavron (as well as the decidedly more impressive Shame with Steve McQueen), and seems to be skimming the surface for a digestion-friendly, undemanding nods of agreement. There’s potential for exploration of the prodding of the proletariat by the privileged in terms of the movement’s foot soldiers, but nothing comes of it. And while it’s fun to see the ladies blowing up pillar boxes, it does make one instantly think of a Python or Goodies parody. More fundamentally, for all her suffering (cos, like, she’s a suffragette), Maud just isn’t interesting enough to sustain the film. Loathe as I am to encourage the straight-edged biopic, I could imagine Streep’s Pankhurst would be a much more conducive prospect, even led away from telling the story at a “street” level. As it is, Suffragette is well-intentioned but forgettable.